A free online course provider, EDX : A number of history courses present - trying the Greek Heroes one. Brilliant thread. Thanks so much to everyone who has posted here. Another excellent series of 15 minute programmes currently running on BBC Radio 4. There is an episode dedicated to Ireland, and much on Ireland throughout the other programmes. These pictures and paintings might interest some people! Caption underneath: Mill worker, Jerpoint, County Kilkenny. *Note the size of the sack, packed with grain, that this man would be used to lifting. * c.1860. c.1890 - Relief works, County Galway. Road and wall building could provide some employment in hard times. Connemara Girl (1865) painting by the Irish artist Augustus Nicholas Burke. Interesting photos of the rallies particularly the numbers in attendance. 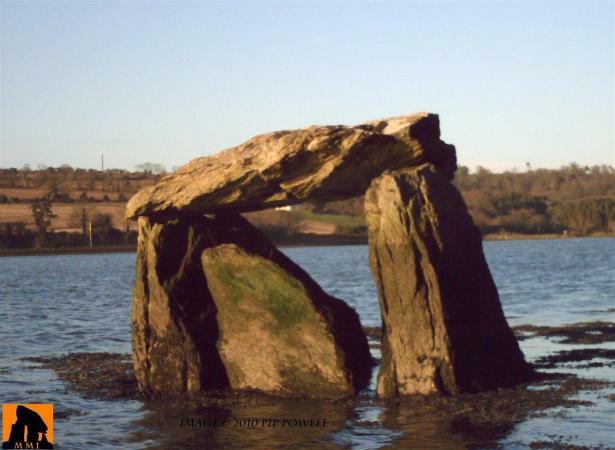 This seaweed-draped tomb is both curious and bleak, situated 10 metres below high-tide level on the S side of a narrow creek opening into Cork Harbour some 8 km E of Cobh. Though two metres high, it does not look at all like a portal-tomb, but is more likely to be the remains of a megalithic kist. The orthostats are slotted into the limestone pavement it stands on. My colleague Tom Four Winds visited it in 2007 and reported: "A moderate-sized capstone is held aloft by just two orthostats. Between these, at the west end, there is another stone forming the chamber. This looks as if it was the back stone and not the doorstone. The uprights are 2 metres tall, about 1.5 metres wide, and they stand 1.5 metres apart. The high tide reaches at least halfway up these, so coming at high tide probably isn't a good idea. Beneath the exposed seaweed around the tomb's base I stumbled (literally) upon another large flagstone. This, presumably, was once part of the tomb. To the west of the monument there are several large boulders that have been beautifully eroded by the ebb and flow of the tide. At the water's edge there seems to be an old quarry, which could be where the stones for the tomb were taken from." No matter what Indians are the best,They have such great amount of history and cultural heritage. Indian Indians or American Indians, or both? A photograph I found lately that I quite like - A photograph of my old secondary school (St. Peter's College Wexford) in 1916. I like the caps. You could not wear one today or some gimp would be crying like a child , wanting to wear it, or just try and take it off ya.